The environment is an ever increasing imperative, and worldwide concern, its protection is important. Hence company put everything into action to reduce their environmental impact. That’s why Winoa is committed to protect the environment and is launching different actions such as process waste, investments in water treatment, air treatment and recyclable packaging. Thanks to its internal and external awareness campaigns Winoa has been certified ISO 50001, and ISO 14001, which are the result of a successful and continuous improvement. “Environment friendly” is not just a concept, but a value Winoa shares, and that we would like to pass on to the next generations. 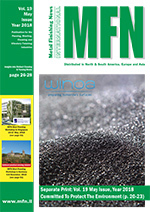 Discover more in our article, published in MFN, May issue.